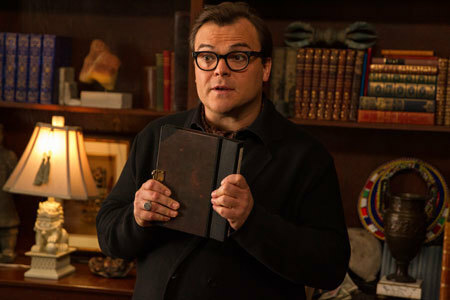 You know funny Goosebumps actor Jack Black as the voice of Po the Kung Fu Panda and from his role as the coolest teacher in town in the movie School of Rock plus many, many other films. Currently, Jack is playing a grumpy version of author R.L. 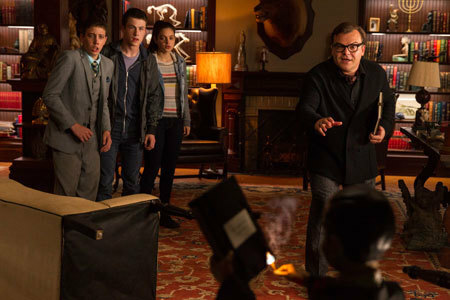 Stine in the family adventure film Goosebumps, based on the popular R.L. Stine novels. Thank gosh R.L. has a great sense of humor and approved Jack playing him… or a more reclusive and overprotective version of him. Jack showed up in Beverly Hills to talk to journalists about fun on set, what gives him goosebumps, his fave scene, fave scary movies and whether he will continue playing rock ‘n roll music. Jack: I stuffed my face so hard at lunch! I need to stay here and take a nap. Q: Right after we talk. Can you talk about your introduction to “Goosebumps” stories and do you read them to your kids? Jack: I have not read them to my kids yet but we did listen to a couple of them on tape on our way to a camping trip. My introduction to “Goosebumps” was this screenplay. I had never read any of the books or seen any of the television episodes but I loved the screenplay and I jumped into it then read some of the books as research and they’re great. They’re really fun to read. If you’ve never read one you should check them out. Q: Was it a lot of fun on set? Jack: It was a lot of fun on the set. We had a different monster every day. The make-up and costumes were unbelievable. Like today is mummy day. It’s ghouls and zombies. Every day was an adventure. My boys came and visited near the end of the shoot and it was a dream come true for them. Q: How did meeting the real R.L. Stine compare to what you read about his character in the script? Jack: We met him before we started filming so we asked him for his notes on the script and his blessing. He loved the script and he didn’t mind that I was doing a much different characterization of him. He’s got a great sense of humor so he was fine that I was portraying him as this anti-social grouch. He understands drama and the necessity for liberties to be taken. Q: Was a lot of the humor in the movie ad-libbed by you? Jack: It was mostly in the script. I didn’t have to come up with improvs. Of course there were a few moments of pure genius. We had some good rehearsal read-throughs before we started shooting. Of course all of Slappy’s dialogue was ad-libbed (Note: Slappy is an evil dummy puppet in the film). Q: What is your favorite monster in the film? Jack: How could it be anyone but Slappy. 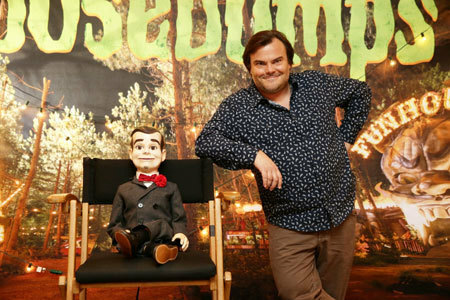 He’s sitting right next to me (at the interview) so Slappy and not just because of the eerie resemblance (to me). He really is quite charismatic. He kind of steals the show. Q: This is a different character than you play in most of your movies. Jack: What was different about this for me was having a character that was not like a lovable, squishy loser hero. This was more of the dark, brooding genius. It was kind of a fun change of pace for me. I’m no stranger to entertaining the kids. I’ve been doing that for more than a decade now. I have a lot of childish qualities myself. I’m like a big manchild so I can relate to what kids think is funny and cool, hopefully. Q: What gives you goosebumps personally? Jack: Home invasion. Right before I go to bed sometimes I’ll be like “I’m so tired but did I lock all the doors?”. But my thing that gives me goosebumps sometimes is the size of the universe. When I think of it I’m like (makes scared noise) and also the survival of the human species. Sometimes I think about the inevitable death of every human being on the planet. I mean it would be sweet if we live all the way to infinity but the sun, at some point is gonna wink off on all the planets but that won’t be for a billion years. We’d be lucky if we make it that long. That or taking off in a plane in a stage one hurricane. That’s never good. Q: Okay.. you think BIG! Do you have a favorite scene? 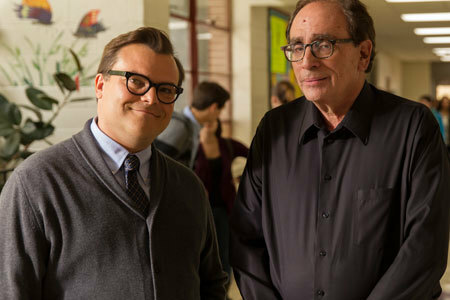 Jack: I like my scene with Slappy when we’re in the Shining set at the high school. It was just me and Slappy mano a mano. Q: What was your most memorable Halloween costume? Jack: Probably Gene Simmons from “Kiss” back in 1986. Q: Good one. What were some of the influences you had on crafting the Stine character, especially that voice you had? Jack: Mostly it was Orson Welles but I wanted to give him a little extra gravitas. I couldn’t just be good old Jables (his nickname) playing the genius writer so I wanted to do someone who was considered a genius and maybe had a dark secret and just seemed like Orson Welles fit the bill so I just literally watched Citizen Kane forty times then went straight to the set. Q: What are your favorite scary movies? Jack: The Shining and Rosemary’s Baby and Exorcist 3 for some reason. I love Part 3 and Part 1. Part 2 is just garbage. The author of the book (William Peter Blatty) came in and directed Part 3. It was the old folks’ home, the old lady crawling on the ceiling and smiling. That’s something terrifying. Q: Would you do a horror movie without comedy? Jack: No. Doesn’t feel right. I have to have a little pinch of comedy in everything I do. Q: This movie is aimed at young people and family so it has to be scary but it can’t be too scary. Jack: That’s the line that R.L. Stine danced around his whole career so that’s what we were aiming for and he sold 400 million (book) copies so you know there’s an audience out there for it. Kids like monsters. I don’t think it’s that big a stretch at all and there’s no blood in the movie and it’s good wholesome fun. My kids love it. It’s only hard because there’s not a lot of movies to compare it to. You’ve got Ghostbusters or maybe Goonies is kind of scary. Q: Are you going to do any more music? Any more Tenacious D? Jack: Yeah, we’re closing in on our next album getting the concept all in place and it’s just a matter of nose to the grindstone. I always feel like it’s never gonna happen but it always does seem to happen so look for it sometime in 2018 would be my guess. (For those who don’t know), Tenacious D is my band. It’s comedy/rock. We don’t just do straight rock. There has to be something funny in every song we do. Q: At this point in your career you’ve got a few classics under your belt. What’s it like to know that people are going to be watching your work years from now. 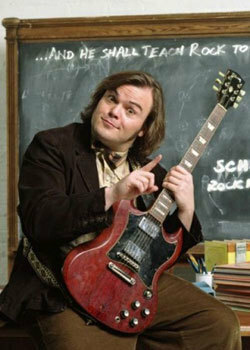 School of Rock is one of my favorite films. Jack: It’s true. After School of Rock I was like “I can die now. That’s going to be the best thing I ever do. I’m never going to connect with a character like that again”. It felt good. R.L. 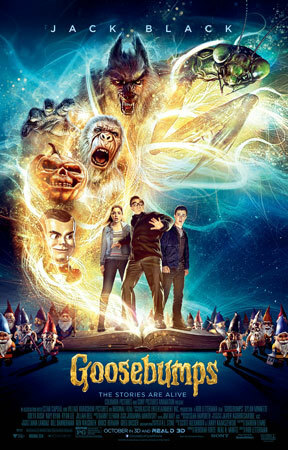 Stine’s Goosebumps is in theaters October 16th! 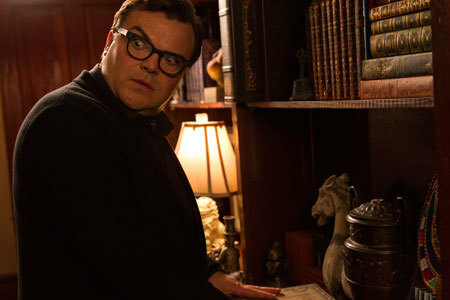 Is Jack Black a favorite actor? Are you into everything Goosebumps? Leave a comment. Fave R.L. Stine Series? Vote!